Director Shafi, whose last venture was Sherluck Toms, has announced his next, titled Oru Pazhaya Bomb Kadha. The movie, a romantic comedy, will have scriptwriter Bibin George (Amar Akbar Anthony and Kattapanayile Ritwik Roshan) in the lead. According to the director, this movie will be quite different from what he has done so far. 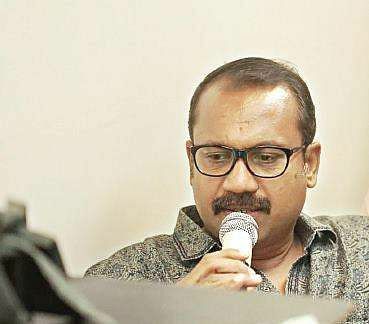 "Almost all my movies follow a certain style, however with Oru Pazhaya Bomb Kadha I will be bringing in a new approach. It will be a comedy, though," he adds. According to the director, this is first time he is working with a debutant. "The movie is set in a hilly hamlet. It tells the story of ordinary people," he added. The movie also has Prayaga Martin the lead. Oru Pazhaya Bomb Kadha, scripted by Biju Joseph and Sunil Karma, will go on the floors in February. The locations are Kothamangalam and nearby areas. The film will also star Kalabhavan Shajohn, Harisree Ashokan, Balachandran Chullikad and Vishnu Unnikrishnan in a guest role.